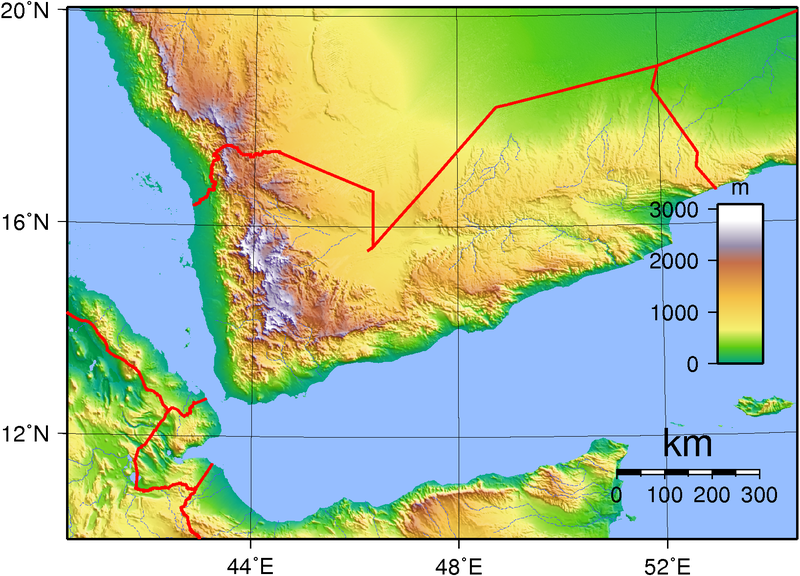 Yemen, a crossroad of cultures where the Red Sea meets the Indian Ocean, was always important for trade between Europe, Africa, India and further east. Shipping along its coasts is among the world’s most active and strategic. It has been ruled by sun worshipers, all three Abrahamic religions — Jews, Christians and Muslims, its location has several times enabled its rulers to control most of the Arabian Peninsula, and it has forever been bedeviled by tribal rivalry. Only 2% of Yemen is arable land. Its mountainous interior is ringed by narrow coastal plains and in the north and east by desert. The western highlands reach 10,000 feet, have relatively fertile soil and get enough rain for sorghum, coffee, bananas and such (coffee is first known to have been cultivated in 15th century Sufi monasteries in north Yemen.) The central plateau gets enough rain for wheat and barley in wet years. The northeastern desert gets little to no rain at any time. Yemen’s sun god worshiping rulers for a thousand years were conquered around 270 AD by the Himyarite whose king a century later converted to Judaism, seemingly to maintain good relations with both Roman Christian and Persian Zoroastrian empires. The Himyarites were defeated in 525 by Aksumites from Ethiopia whose king converted to Christianity around 350 when the Roman emperor also began trying to convert Yemen to Christianity. Fighting between Jewish and Christian warlords continued for centuries, then in 630 Mohammed introduced Islam in the person of his cousin, Ali. Ali is considered by Sunnis nothing more than the fourth of Mohammed’s elected successors as leader of all Muslims. Shias, however, consider him Mohammed’s rightful successor. That disagreement plunged the Muslim community into violent conflict that still persists 1,400 years later. Muslim Yemen was ruled by a Shia dynasty founded in the north around 1040, then Sunni ones of Kurdish origin that invaded from the south. When Portuguese merchant ships arrived in the early 16th century, the governor of Egypt began conquering Yemen to protect the Ottoman trade route with India. Then the British entered three centuries later wanting a base to stop pirate attacks on their trade with India. They were in 1838 granted by a local Sultan 75 acres around the ocean port of Aden. After the Suez Canal was opened in 1869 cutting 4,300 miles off the sea voyage between Europe and India, Aden became a coaling station. and Britain expanded inland from there. While Britain gained control of south Yemen, the Turkish Ottoman empire retained nominal control in the north although tribal chiefs there made real control impossible. In 1918 when the Ottomans fell, a kingdom was established as North Yemen that in 1962 became the Yemen Arab Republic. South Yemen continued to be ruled as part of British India until 1937. It remained a British protectorate until armed struggles that began in 1963 resulted in its independence in 1967 when Britain was also forced by Egypt to relinquish control of the Suez Canal. Marxists gained power in South Yemen in 1969, established the People’s Democratic Republic of Yemen and formed close ties with the Soviet Union, China, East Germany and the Palestinian Liberation Organization. The Soviet Union gave them strong support for which in return they got access to South Yemen’s ports. North and South Yemen united in 1990 with North Yemen’s leader as President. He outraged our government later that year by opposing military intervention from non-Arab states when Iraq invaded Kuwait. Saudi Arabia supported us by expelling 800,000 Yemenis. South Yemen seceded in 1994 with active support from Saudi Arabia but was defeated in a brief civil war. There is still substantial support in south Yemen for an independent state. When rebellion by Shia Houthis began in the north in 2004, the weak government tried allying with al Queda in unsuccessful counter attacks. Then we began drone attacks on al Queda when in 2009 the Saudi Arabian and Yemeni branches merged to form al Quaeda in the Arabian Peninsula (AQAP) based in Yemen. Yemen’s government was now trying to defend itself against Shia rebels in the north, separatists and AQAP in the south. Yemen never had effective government institutions. Since it was unified, leaders of competing tribal, regional, religious and political groups have collaborated just enough to make it the 164th most corrupt of 182 countries in Transparency International’s 2009 survey, and it was ranked last of 135 countries in the 2012 Global Gender Gap Report for violence against women. Pagan, Jewish and Christian influences from before Islam’s arrival are long gone. For a thousand years the former North Yemen has been Shia, the former South Yemen Sunni and the two have been proxies in great empires’ wars to control trade routes. Yemen’s history of never-ending struggles for power and wealth make it hard to see how a stable, unified, modern form of government can be established. The latest development is, a few days ago Yemen’s President Hadi, who replaced the previous leader in a 2011 pro-democracy uprising and was trying to end secessionist and tribal unrest, resigned in frustration. Al Queda forces already controlled much of the south. Now Houthi rebels had taken control of the capital, Sana’a. Warriors from north Yemen always have been formidable and their latest incarnation, the Houthi, were doing better against al Queda than the government forces. They seemed set to take over. So what should our government do? We have spent nearly $1 billion on military, economic and humanitarian assistance in Yemen since 2011. Who should we support now? Who are the good guys? Who, for that matter, are the bad ones? Can Yemen’s government survive and will its next leader, like ex-President Hadi, support our drone attacks on AQAP? Or will the next government turn back to AQAP to counter the Houthi? Who are the local great powers supporting? Saudi Arabia’s fundamentalist regime supports the Sunni in south Yemen, and AQAP is supported by Saudi Arabians. Iran’s fundamentalist regime supports the Shia Houthi in the north, which borders Saudi Arabia. We support the Saudi regime and have opposed Iran since its 1979 revolution. President Bush branded Iran in 2002 part of “an axis of evil, arming to threaten the peace of the world.” We have been placing ever-tighter economic sanctions on Iran. Echoing President Bush, National Security Adviser Rice said, “Iran’s direct support of regional and global terrorism and its aggressive efforts to acquire weapons of mass destruction, belie any good intentions it displayed in the days after the world’s worst terrorist attacks in history.” In 2003, we invaded Iraq on the pretext that it already had weapons of mass destruction. So should we continue to support Yemen’s weak government, should we instead support the Houthi who have been more successful than the government against al Queda, or should we join Israel in supporting Saudi Arabia and its proxies who include al Queda in south Yemen? Our government is deeply divided. President Obama is engaging in diplomacy with Iran. Congress just invited Israel’s leader to address them for a third time on why we should support Saudi Arabia and cripple Iran whose leaders support Hezbollah, the Shia force Iran established in 1982 to resist Israeli occupation in Lebanon. We have no good allies in this part of the world. The forces in north and south Yemen are on opposite sides of a 1,400 year-long battle that never had much to do with religion, was always about power, and is now amplified by rivalry between Iran and Saudi Arabia. Battles for power in the Middle East now are much like those between Protestant and Catholic nations in medieval Europe. Our military actions in the Middle East lead only to more suffering (as well as dependable sales of weapons.) Instead of continuing to make war, we should support UN peace-keeping forces. And what about terrorism? No matter how horrific and whether committed in the name of Islam, Christianity, Hinduism, Buddhism or any other religion, or whether committed in the name of communism, anti-communism, anarchism or any other ideology, terrorism is a crime of violence. Crime cannot be ended by war. Crime cannot be ended at all, in fact, but it can be minimized when the rule of law is supported by an effective system of justice and policing. After exploring more of the Middle East, I will consider how international justice and policing could more effectively counter al Queda and other terrorists. Reuters reports airstrikes on the Houthi militia in north Yemen by Saudi Arabia and Arab allies, which Iran denounces as “complicating efforts to end a conflict likely to inflame the sectarian animosities fueling wars around the Middle East”. “We will do whatever it takes in order to protect the legitimate government of Yemen from falling,” said Saudi Arabia’s ambassador to the USA. Saudi Arabia has 100 warplanes operating there supported by over 85 more from Jordan and other Middle Eastern nations, plus Morocco and Sudan. And Egypt has sent warships to secure the Gulf of Aden. A Saudi official said a “land offensive might be needed to restore order.” The BBC reports Saudi-owned TV as saying that Egypt, Jordan, Sudan and Pakistan are ready to take part in any ground offensive. The White House says it supported the operation and President Barack Obama authorized US “logistical and intelligence support”. The airstrikes are directed against the Shia uprising whose stated aim is to replace the government that no longer exists, which they correctly say was corrupt, and implement constitutional and electoral reforms from the National Dialogue that was convened when the previous government fell in 2011. Yemen with its mix of Sunni and Shia continues to be a pawn in the escalating rivalry between Sunni Saudi Arabia and Shia Iran. Military action by them and other outside powers, including the USA, will bring not peace but only ever-increasing suffering to the people of Yemen.